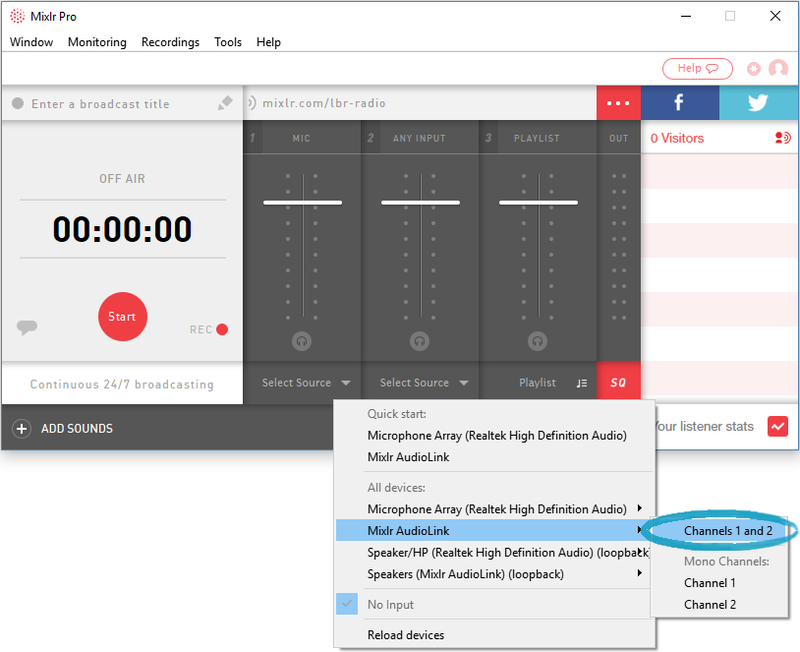 If you want to broadcast audio from another audio application but it's not possible to directly route the audio to Mixlr, or if you want to broadcast from a webpage - e.g. from SoundCloud - then you can route all of the audio from your computer desktop to Mixlr using Mixlr AudioLink, an audio device that is installed when you download Mixlr. 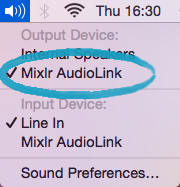 In order to send your audio to Mixlr you will need to change the speaker output on your desktop to Mixlr AudioLink. On Mac you can do this by holding down the Option key and clicking the Sound icon, then selecting 'Mixlr AudioLink' as the output device. On Windows 10 you can do this by clicking the Sound icon and then clicking the upwards arrow that appears in the top right. Select 'Speakers (Mixlr AudioLink)' from the options. 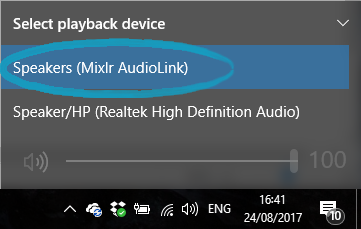 On earlier versions of Windows you will need to right-click on the Sound icon and click 'Playback devices', then highlight 'Speakers: Mixlr AudioLink' and click 'Set Default'. Next, open the Mixlr desktop app. Click the arrow by 'Select Source' for other channel 1 or channel 2 (the MIC and ANY INPUT channels) to bring up the list of input options. 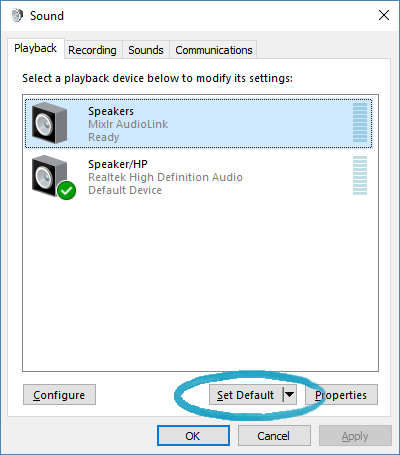 Select 'Mixlr AudioLink > Channels 1 and 2' from the list. 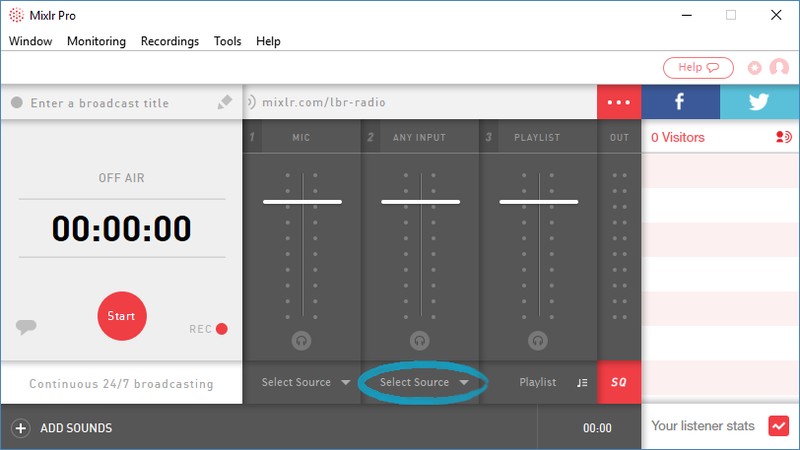 When Mixlr AudioLink has been selected you will see it listed as the input for this channel, where 'Select Source' was previously displayed. If there is an audio signal being played on your desktop you'll see the visual display indicators for the channel lighting up - these are the white lights showing up in the image above. You are now sending all the audio from your desktop into Mixlr, so if you start a broadcast any sound that happens is played on your desktop - for example an advert on a webpage, or an audio alert when you receive an email - will be played through Mixlr as well. So make sure you close any unnecessary webpages and mute anything that you don't want to be included in your broadcast! Because you have sent all the audio from your desktop to Mixlr you won't hear anything through your speakers. In order to hear what you are playing you will need to activate monitoring. Click here to find out how to activate monitoring.